We get a lot of questions about how to use PLR, how to profit from PLR and so on. In my opinion, the best way to look at PLR is to see it as a collection of reusable content that you are acquiring at a far cheaper rate than if you were having the content built from scratch by a ghost writer or if you were sitting down and creating the content from scratch yourself. When you use it correctly, PLR is one of the best investments you will ever make for your online business. But, like anything else you purchase, unless you have an implementation plan, it will not serve you any benefit whatsoever. As a PLR producer, I know my days are numbered if I cannot help you make a return on your investment. I want you to come back in the future and purchase more PLR from us and I know the only way to do that is to make sure you are getting REAL benefit from the content you acquire from us. So, we have put together the following 4 part check list that you can use ANY time you acquire a new piece of PLR content (whether you purchased it from us or someone else is irrelevant). 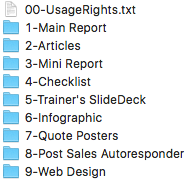 Most PLR content is distributed in a specific folder structure. For example, the image below shows the product packaging for our PLR product The Power Of Forgiveness . As you can see there is a LOT of content included in this package from an ebook to articles to a short report, marketing graphics and more. NOTE: You do not need to use every single component of this PLR package to get value from it. Some people may purchase a PLR program like just for the article content or the report content alone. In most cases, the PLR license to acquire the content is far less expensive than hiring someone to write similar content from scratch. 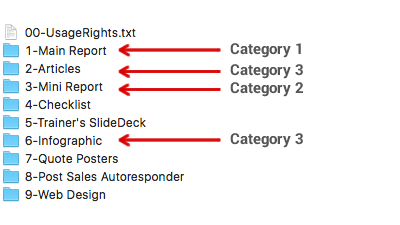 Most PLR packages you purchase will generally contain content that falls into 3 categories (in some cases, a PLR pack will include multiple items that fall into all 3 categories so pay attention to what your PLR includes). This would be things like ebooks, digital training programs, audiobooks, video courses and so on. This would includes items like free reports, white papers, private blog posts or autoresponder messages designed as content to “incentivize” people to join your list so you can sell them something in the future. This would include things like blog posts, sharable documents, free audio podcasts, Youtube videos, social media posts (like Tweets or Facebook status updates). Any content that you distribute freely online as a way to showcase your expertise and “brand” yourself in your marketplace. Based on the 3 categories laid out in Step 2, decide how you can use the current PLR package you are looking at. You may just have 1 implementation idea, or you may have many. The following is a list of PLR implementation ideas for EACH of the 3 categories along with links to specific training modules you can use to help you implement any idea you choose. Example 1: Create an ebook/digital product that you sell on your website. Training 1: Watch this video and take note at the 7:00 minute mark for a specific example of creating a digital product for sale. Example 2: Create a premium piece of content for a paid membership. Training 2: Check out this membership site training video and pay specific attention to Tip 3 which deals with PLR in memberships. Example 3: Merge your PLR with other content to build a larger course/ training program. Training 3: Check out this training session where I take some PLR and integrate it with a course I’ve already built to add value. Example 4: Narrate (or hire) the audio from PLR text to create an audiobook to sell alongside an ebook. Example 5: Record the PLR contents into a video to sell an ebook/ audiobook (or both) version of the content. Example 1: Create a free course/guide that you give away as a lead magnet. Training 1: Check out this important training video which shows an example of taking a PLR course and using it to generate high quality leads for a coaching/consulting business. Example 2: Create a free download that enhances a blog post and generates laser targeted leads based on specific interests. Training 2: Check out the contextual opt in training video here. Example 4: Create content for a free membership you use to nurture leads and build a relationship before they make a buying decision. This is by far the most popular “category” or usage model for implementing PLR content. There are a HUGE number of ways you can take PLR content and turn it into free public content online that markets your brand and spreads the word about you and your company. Note: When using any examples from this category, it is important to make sure the PLR you are using has “web publishable” rights. In other words, make sure you can take the content and publish freely. Example 1: Merge various pieces of PLR content together to build something totally unique. Training 1: Check out this training video about building unique content. Example 2: Use PLR to “curate” your existing content like Youtube videos, articles, blog posts, etc… into a new piece of sharable material. Training 2: Watch this training video about using PLR to curate content. Example 3: Create personal branding videos to get your face/name/voice out there more. Training 3: Visit this training page and watch the training video and the example video included. Example 4: Increase your productivity by batching your content marketing. Work in 1 block but queue up content for days, weeks or even months. Training 4: Check out this batching with PLR training video. Example 5: Use PLR infographics to create highly sharable social content. Training 5: Watch this PLR infographics training video. Training 6: First watch video 1 – how to use infographics to create marketing videos. Then watch video 2 – this example in action. If you purchase a PLR product, you likely did so for a specific purpose. Hopefully the examples above give you 1 or more ideas that will help you implement the PLR so you get a return on your investment. Remember that you purchased a “license” to this content so you are entitled to use it as often as you see fit. Store each PLR package you purchase into some kind of “assets” folder on your hard drive or company Dropbox for future use. You may end up using a single piece of PLR a bunch of times in the future.